Maple Leaf. This shipwreck site at Mandarin Point is the only National Historic Landmark in Duval County and it still contains a treasure of hundreds of tons of cultural material from the Civil War - safely sleeping beneath eight feet of river bottom mud! Two years ago we celebrated the 150th Anniversary of this event with special events and a new exhibit. We found out that the Maple Leaf story is still of much interest to visitors, which is why we have kept our expanded exhibit up and still have "Meet the Maple Leaf Divers" days every month. And, it is why we want to expand the museum space to make a larger, permanent Maple Leaf exhibit in the future. We had no idea what a gift the 150th anniversary was going to be to us. I would like to take this special day to thank Dr. Keith Holland and every one of the SJAEI divers who has been involved with us over the last two years. With apologies to anyone I may have left out, we especially thank Steve Michaelis, Paul Kramer, Mike Dupes, Bobby Lunsford, Larry Tipping, Mike Barker, and Chris Manley. These men have come back together as a team to give hundreds of hours of their time to educate the public about this ship and their efforts to recover and preserve the artifacts from it. They have made the Mandarin Museum the center of the universe for Maple Leaf research - no where else is there as much information available - all because of their partnership with us. There are absolutely no words adequate to express our gratitude to each of them for coming into our lives at MMHS. But we want to publicly thank them - for your generosity of time, talent and resources, but most of all for enriching the lives of every volunteer, member and visitor that comes across our threshold. 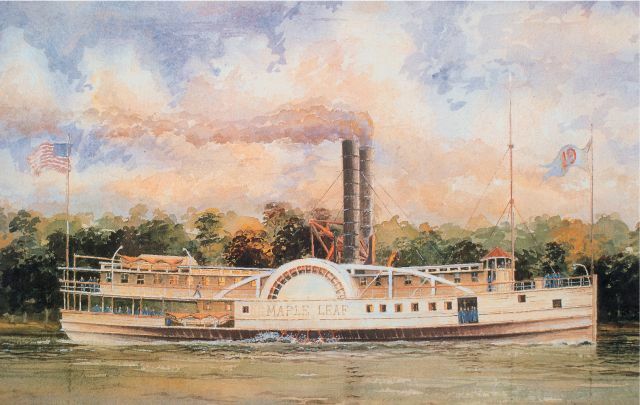 Let's all take a moment to remember the Maple Leaf today and thank the men who cared enough about history to find this ship, recover material from it, preserve that material and now show and tell us all about it! 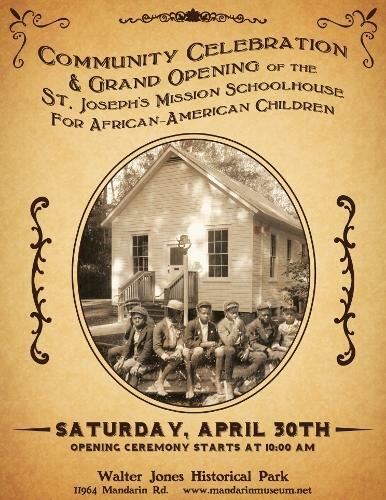 Yes indeed, 118 years after it was built and 15 months since it was moved to Walter Jones Historical Park - we will celebrate the Grand Opening of the one-room schoolhouse that we are calling "St. Joseph's Mission Schoolhouse for African-American Children!" PLEASE JOIN US as we celebrate this extraordinary community effort to save, preserve and interpret some very important history through this special building - the only one-room schoolhouse left in Duval County. 11:30 - Music, Poetry and Dance by the children of the "Don't Miss a Beat All-Star Performers." The schoolhouse will be open from 11:00 - 4:00 pm for visiting, as will the Mandarin Museum and all of the historic buildings in Walter Jones Park. 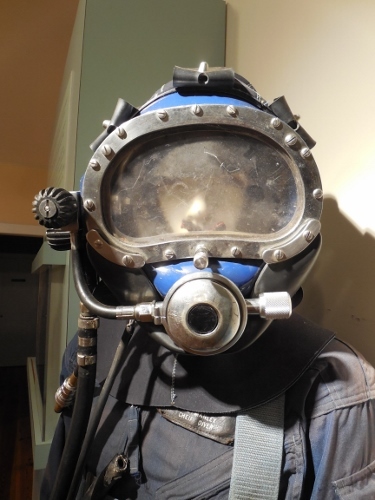 Dr. Holland and Maple Leaf divers will be in-house at the museum also. Refreshments and a Grand Opening cake will be served. Parking will be across the street from the park at Mandarin Presbyterian Church. 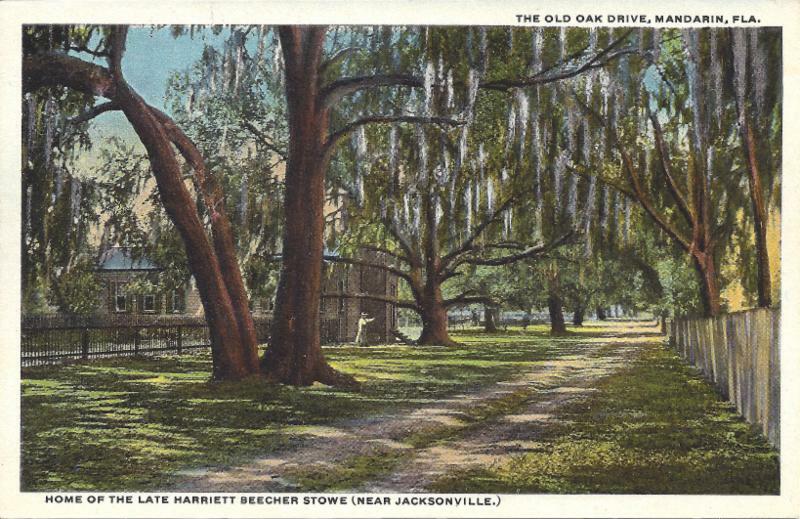 Walter Jones Historical Park is located at 11964 Mandarin Road. This day is a "Lift Every Voice" event through collaboration between two Cultural Council Services Grant Program organizations - Mandarin Museum & Historical Society and Don't Miss a Beat. "Cultural Fusion's 2016 theme LIFT EVERY VOICE amplifies, through collaboration, the stories of our community's unique cultures, causes, and people." "But we don't know anything about Florida History," said Barbara Campbell when Sandy Arpen suggested that she and her son Matthew might enjoy being volunteers at the Museum. It was a Monday. The Museum is not open on Monday, but as it happened, Sandy was at the Museum to meet a heating and air conditioner repairman when Barbara and Matthew had seen the Walter Jones Historical Park marker on San Jose Blvd. When Sandy heard someone on the porch she came and greeted us," said Barbara. "She was so warm and friendly. After assuring us that we didn't have to know Florida history, we would be taught about our local history, we said yes to volunteering." That was the first week in January, 2012. Barbara and Jeff Campbell had moved to Jacksonville only days before because of a job change. Barbara recalled her concern with the move from Bedford, Indiana where their support system was. That support system had been so helpful as the Campbells raised their sons, Matthew, who was diagnosed on the Autism spectrum when he was five years old, and Andrew, who was a freshman in college the year they were leaving Indiana. "I just couldn't believe leaving the programs we had been blessed to have as a part of Matthew's life," she said. Matthew had been attending a junior college in Bloomington, Indiana and he wouldn't be starting at FSCJ until fall 2012. In the meantime, Barbara wanted some opportunities where they could work together. Visiting museums is one of the things that Barbara has enjoyed throughout her life. She grew up surrounded by historical parks including one that honors the career and memory of Astronaut Gus Grissom who was from her county. Matthew also enjoys learning history and going to museums. So the sign on San Jose became a perfect invitation to them. So was Sandy's invitation. 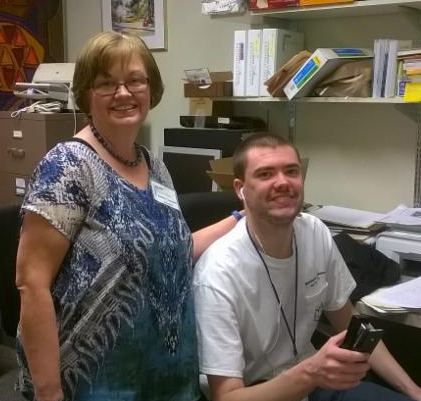 Each time Barbara comes to docent at the museum, she is accompanied by Matthew who spends his time scanning documents and working on computer projects. He also helps at special events. "Matthew has been such a valuable member of our team and I love working with him", said Sandy Arpen. "He is a perfectionist and an expert on the computer. As a matter of fact, he built an Access data base for us that lists every DVD we own, mostly oral histories and museum programs. This allows us to search easily and find a specific program or speaker. What a gift." When Barbara and Matthew are not at the museum, they enjoy church activities including the fact that Matthew is in the church orchestra. Matthew will soon graduate from FSJC and intends to go UNF to major in computer science. "But I still like to come here", he said with a smile. We sure hope so because Barbara and Matthew have been faithful and important volunteers and we are grateful for their commitment and their contributions. Do you remember this view? If you lived around here in the 40s, 50s and 60s you do. This was when the little Store and Post Office was the true heart of the community - when people posted signs on the wall, swapped magazines and newspapers and gathered inside to listen to the radio together or to make a phone call or to hear the latest news or gossip. 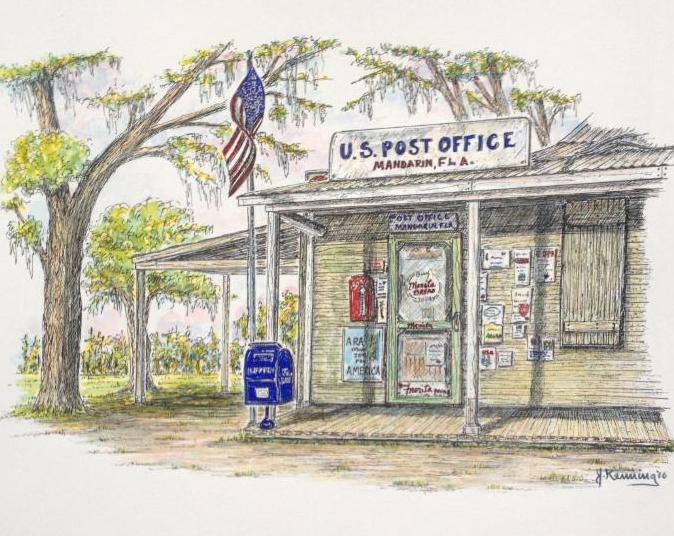 John Kenning, local artist and Mandarin resident since birth, captured the spirit of those days in his pen and ink drawing, which was taken from an old photograph. He then proceeded to print a limited edition of the B&W drawing and colored prints and donated them to Mandarin Museum as a gift to raise funds for our programs. So, you too may own one of John's special prints and help the museum at the same time. Check out the Museum Gift Shop any Saturday to see the prints. We have B&W pen and ink prints, colored prints (both limited to 100 that will ever be made) or you may order a "hand colored" print that John will do for you (limited to 25). Each print is also accompanied by a discount coupon for framing. John is also working on two views of the Maple Leaf from an underwater perspective- one of the wreck and one of the diving operation. We are very grateful to him for the gift of these Store and Post Office prints, for his membership and his involvement at the museum. 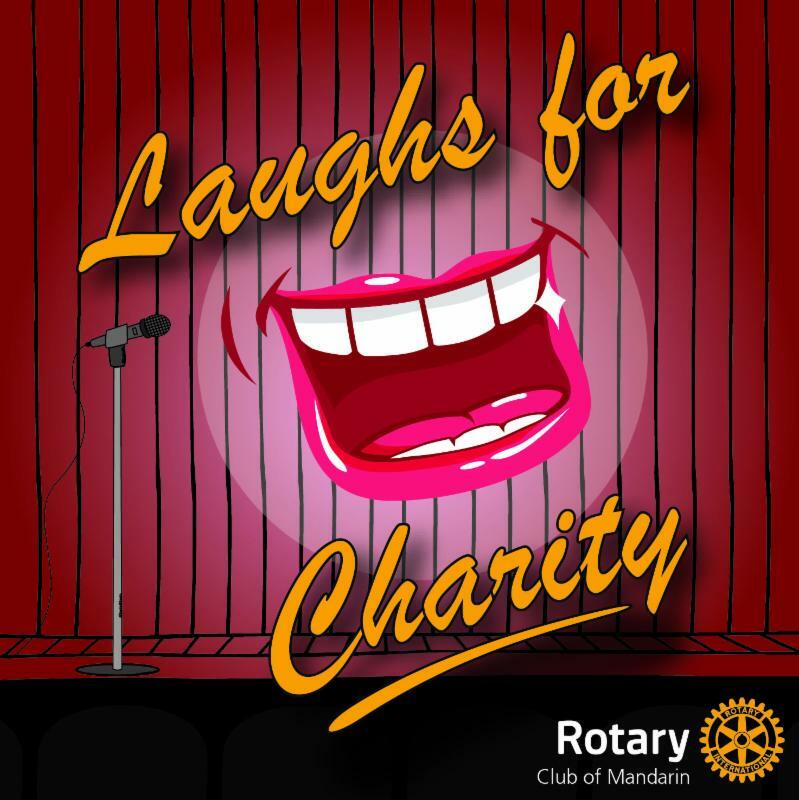 The Rotary Club of Mandarin presents "Laughs for Charity 2016"
Remember last Spring's event that was so much fun and which ended up raising enough money for Mandarin Museum & Historical Society to be able to complete the schoolhouse painting, landscaping, AC, repairs and exhibits AND allowed us to conduct school tours with five schools who have never been to Mandarin before? This was a TREMENDOUS gift to our project and the community. Well, this year's event is right around the corner, and you can still buy tickets and help support Fire Station No. 42 in Mandarin. Please support Rotary activities when you can, as they have been a great friend to the Mandarin Museum over many years. Please make checks payable to Rotary Club of Mandarin Charities, Inc. It has been said many times over many years that "Mandarin residents LOVE their trees!" Thanks to the Scenic and Historic Corridor ordinance introduced by former Council Member Mary Ann Southwell, the tree canopies along Mandarin, County Dock and Loretto Roads were protected in the heart of Mandarin. 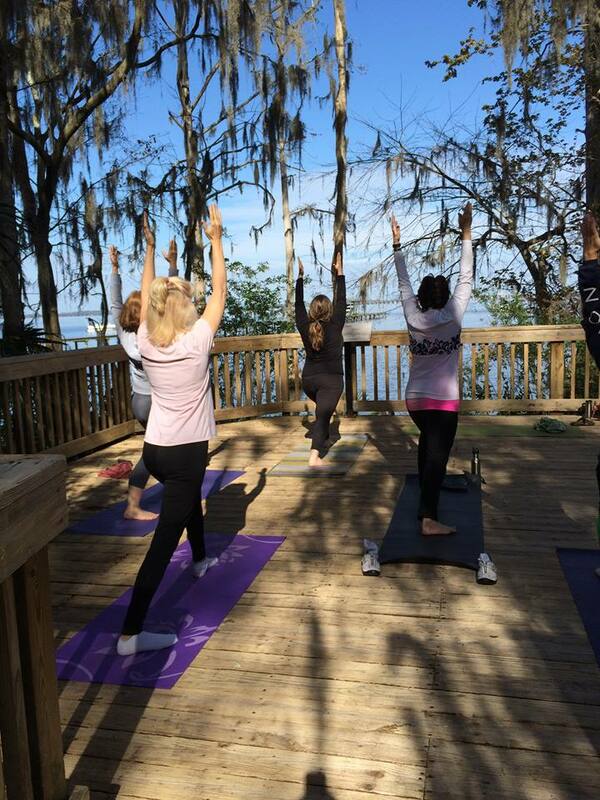 We are proud of the stately live oaks and dripping Spanish moss that define our community. For this reason, May's Third Thursday Lecture will be of great interest to everybody who desires to maintain this appearance. The lecture will be presented by Joe Anderson, a utility forester for JEA. Anderson's primary responsibility is to ensure that the power of Jacksonville can be found in the canopy of trees. In this talk, Anderson will be branching out from the discussion of electrical, water, and sewer services to talk about trees. More information to come next month, but mark your calendars now for the Third Thursday Lecture on May 19. This popular community jam is back after a Winter break! All are invited to play, listen, paint, or dance. Bring a chair and water. The museum will be open for viewing and restrooms. 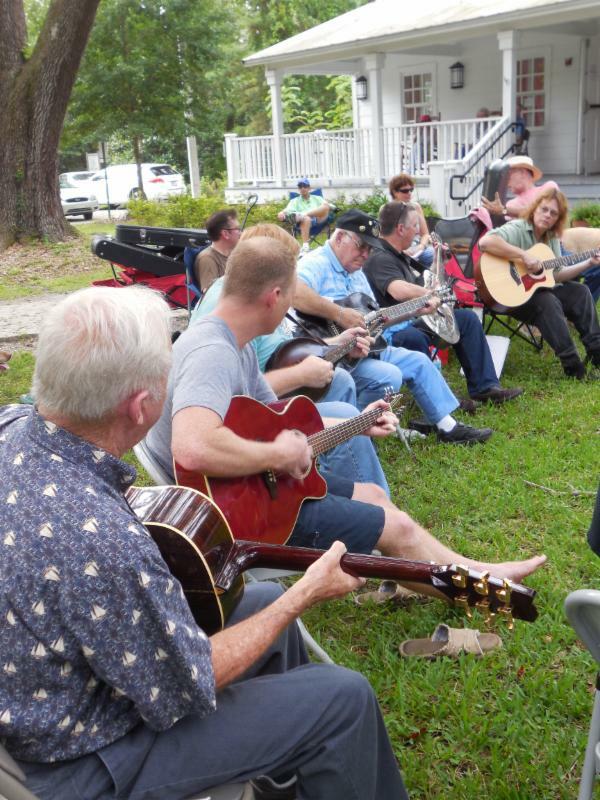 Held at Walter Jones Park, weather permitting. Saturday, April 16 from noon - 4 at Mandarin Museum. April 1 - 1:30 pm at Mandarin Museum - Meet Riverkeeper Lisa Rinaman, river advocates and Dr. Keith Holland on the 11th stop of the St. Johns Riverkeeper event - SAVE THE ST JOHNS. Click here for more info. Mandarin Museum (11964 Mandarin Road) is open every Saturday (except Dec. 26) from 9-4 in Walter Jones Historical Park. The Mandarin Store and Post Office (12471 Mandarin Road) is open the first Saturday of every month from noon - 4. We NEED you - especially with the schoolhouse opening soon. Please call Paula today at 403-5024 or e-mail mandarinmuseumvolunteers@gmail.com and she will get you started. It is painless. It is fun. It is rewarding. Be part of our MMHS team! 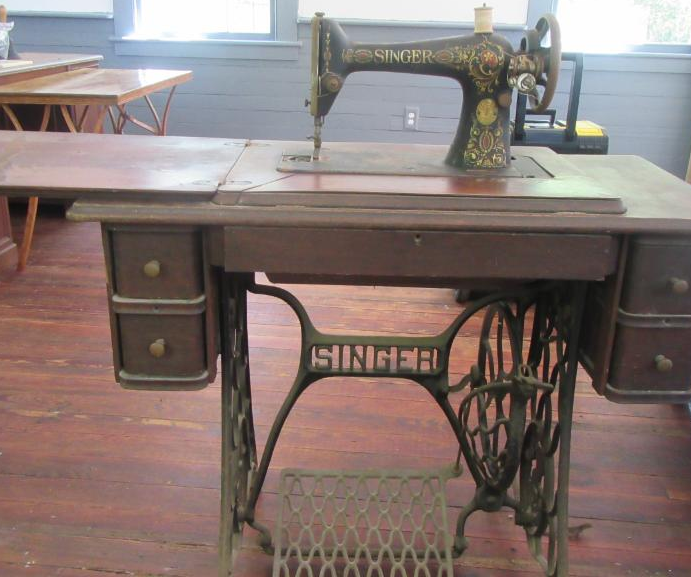 This vintage Singer sewing machine is currently in the schoolhouse and it must go. It is lovely, especially the decals. It wouldn't take much to clean it up and refinish it for a lovely piece in your home. First offer of $100 gets it.